T he recent proliferation of books and articles devoted to vision and visuality has prompted speculation of a ‘pictorial turn’ or ‘paradigm shift in the cultural imaginary of our age’.2 Yet despite this interest, and the expanding body of scholarship it has produced, the medieval period has remained curiously under-represented. 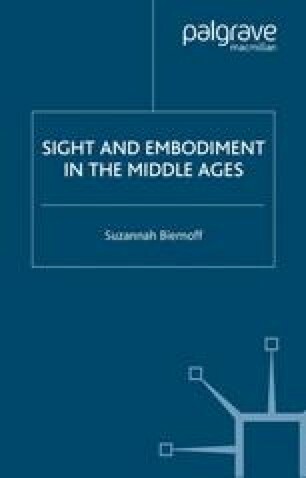 To quote Jeffrey Hamburger, ‘the relation between medieval and modern modes of vision remains vexed, in large measure because, the history of optics and perspective aside, it remains virtually unexamined’.3 This book will, I hope, enable such historical comparisons to be made. But before we turn our attention to the Middle Ages, it seems salutary to reflect on the visuality of modern historiography. Where medieval vision is concerned, I believe we are dealing less with a scholarly oversight than with an historical blind spot. There are at least three plausible reasons why historians and theorists of vision may have neglected medieval texts or images. The first has to do with the critical apparatus available to the contemporary theorist. Recent work on visuality has been dominated by a Lacanian paradigm in which the visual gestalt—the mirror image for example—signifies the bounded subject of modern culture.